With the exception of the first formed roots (which respond to gravity) tree roots can grow in the ground, on the surface of the ground, in water, and in the air. Roots grow when the environment supplies nutrients, oxygen, warmth, and water. Tree roots do not have a predetermined growth pattern, they grow in an opportunistic manner when the environment is right. A big part of caring for your tree is understanding root growth and providing the means for them to do so. Our team of arborist compiled the following information to help you keep your trees growing strong and healthy. How Deep Are the Roots of A Tree? The answer to this question is directly linked to the type of soil the tree is planted in and availability of water (among other factors). However, in most cases, the majority of a tree’s root system can be found within the top 18 inches of soil. When soil conditions are dry, many of those roots will grow along the surface. Root Compaction – As the majority of roots are growing near the surface, it is vital to a tree’s health that this soil remain aerated and fertile. A common mistake on construction sites or even in landscaping projects is to run or park heavy equipment too close to trees. This “innocent” act compacts the soil and smothers the roots. If enough roots are damaged, the tree’s health can be compromised, eventually leading to disease and death. 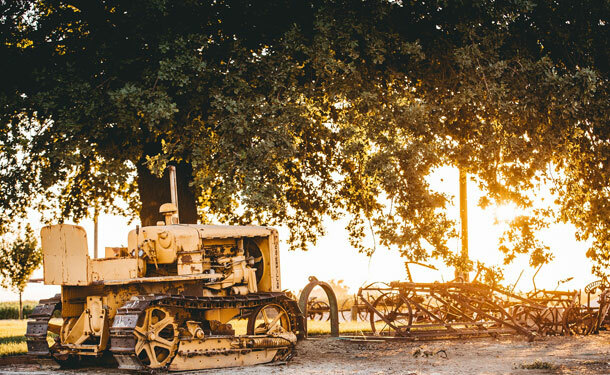 In many municipalities across the nation, tree ordinances and land disturbance ordinances are now in effect to protect the land surrounding trees during construction and landscaping projects. Root Spread – A common misconception is that “Tree roots only grow to the tree’s drip line.” This couldn’t be further from the truth. In their never ending quest for moisture and nutrients, tree roots can grow well beyond the drip line. An uninhibited healthy root system is able to grow into an area 5 to 7 times the surface area of the crown. Look at it this way: If the crown of a mature and healthy tree has a surface area of 100 square feet, it is quite possible that the root system is occupying a 500 square foot area. That is well beyond the drip line! Tree Roots Above Ground – As mentioned above, when soil conditions are dry or compacted (seen often when soil has high clay content), roots will grow along the surface. Note that some trees naturally grow this way regardless of the soil quality. These roots should be protected. Mowing over them, injuring them, shaving them down, or cutting them out puts the tree at serious risk of fungal infections, pest infestations, disease, compromised health, and potential death. Tree Root Removal – Don’t do it. Without a deep understanding of how root removal impacts the health and stability of a tree, you are likely to severely harm or kill the tree. Any root pruning or removal should be performed by a certified arborist. When creating a landscape, urban forest, or yard upgrade, it is necessary for the health and longevity of your plants, trees and shrubs that varied species of each are planted into the ecosystem. Just as important is fertilization, watering, and mulching of the soil. The proper preparation of the soil will allow the tree and plant roots to thrive and (very importantly) permits the growth of mycelia which spread and colonize those roots, eventually creating a mycorrhizal network (read more about this network here – www.thetreecareguide.com/trees-silently-communicate-below-the-surface/. Mycorrhizae Network Associations – We are indeed talking about fungi. There are thousands of different fungi able to create a symbiotic relationship with the root systems of plant life. By doing so, the “infected” plant, shrub, or tree activates its chemical defense system. This alone strengthens the host’s immune system. While the fungi receive nutrition from the host, they in turn increase the efficiency of the root system by providing a conduit between them. This conduit can transfer signals from one tree to another and assists those trees in transferring water, chemicals, and nutrients between them. Watch this video for a further understanding of how tree roots are colonized and communicate with each other. Shared Root Systems – Trees can naturally share root systems. As a tree’s roots grow and spread, they may come in contact with other tree roots. As they grow alongside each other and increase in size, they can grow or graft together. This act connects the two root systems becoming one larger root system. 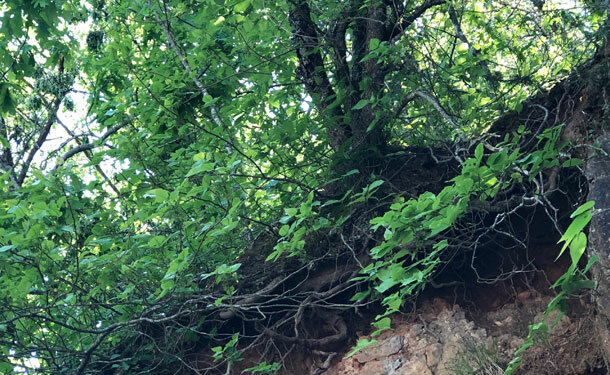 Benefits of Grafted Root Systems – When root systems combine forces in this manner, the trees are now working in tandem to collect water and nutrients. The leaves of each tree are also photosynthesizing and sending sugars to the roots in benefit of each other. Thus, the health of the two trees is now supported as one. Downfall of Grafted Root Systems – While there are tremendous benefits to this association, its largest deficit occurs when one of the trees becomes diseased. If the tree is unable to contain the disease, it is likely that it will spread to its roots and on to the grafted tree roots. Thus compromising the health of the other tree. In order for a tree’s roots to grow strong and deep, they need soil that caters to their species. Some prefer more acidic soil while others prefer more sandy soil, and so on. Before planting a tree, find out the optimal soil composition for that species and match your soil to it. How Much Soil Should Be Prepared – That depends on the amount of initial root growth you want. Instead of digging 1½ feet deep and treating the soil for a 3 foot wide hole (for a sapling overstory), treat the soil within a 6 foot radius of where the tree will be planted. As the tree grows, continue adjusting the soil’s pH levels to optimize root growth. Types of Soil – Your tree’s roots will be directly impacted by the type of soil they encounter as they grow. When preparing soil for a new tree, try to match the soil to the species’ preference. This will promote healthy (and faster) root growth. Sandy Soil – Contains loose particles which allow air to penetrate and water to run off. It does not hold moisture very well and is typically poor in nutrients. Clay Soil – Contains compact particles which do not allow much air retention. This soil holds water very well and is generally high in nutrients. Sandy, Clay Soil – This soil is a combination of the first two. It is able to retain air, and is dense enough to keep moisture while being nutrient rich. Watering Your Tree – A fundamental resource for all plant life is water. In the absence of rain, your newly planted tree should receive deep watering twice a week for the first 2 to 3 months. This will naturally help the roots grow deep and strong. As the tree grows, the watering should spread wide, as the roots are extending beyond the trees canopy. The following video addresses tree watering in dryer climates. Often times, we revel at the incredible trunk, branches, and canopies of the trees around us. We forget that under our feet, the roots of those trees are constantly seeking moisture, nutrients, associations, and staving off infection and disease. Growing healthy trees is more than pruning a branch or two every year. Your attention needs to be given as much to the soil and roots as to the trunk, branches, and leaves.